Her Royal Highness The Countess of Wessex was today elected as President of the Devon County Agricultural Association (DCAA) for 2017. The DCAA organises the Devon County Show, which will be held this year from May 18 to 20, as part of its mission to promote and develop Devon’s rural economy. The Countess is a keen supporter of British agriculture in general, and agricultural shows in particular. HRH is a past President of the Royal Bath and West, the Royal Cornwall and the New Forest and Hampshire Shows, and is Patron of the Association of Shows and Agricultural Organisations (ASAO), which represents agricultural shows across the country. Speaking at today’s (January 20) AGM of the DCAA at its Westpoint headquarters near Exeter, The Countess said that she was greatly looking forward to her year in office. 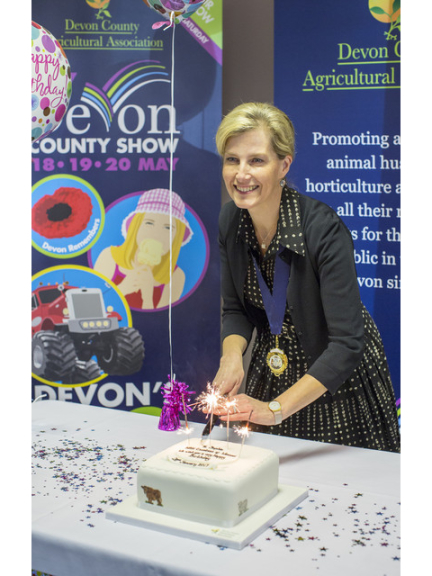 The Countess, who celebrates her 52nd birthday today, was delighted when she was presented with a birthday cake, complete with candles and iced with farm animals, in front of more than a hundred DCAA members. For the DCAA, Chairman of Council Mary Quicke MBE said that the Association was delighted and honoured that The Countess had been able to accept the invitation to serve as President. “We know from what our colleagues at those and other shows have told us, and from The Countess' involvement with the ASAO, the very real interest that HRH takes in every aspect of running a successful show, and that she will be very much more than just a ceremonial President. The Countess and The Earl of Wessex enjoyed a hugely successful visit to the Show in 2009 when they met hundreds of people involved in many walks of life from agriculture to the military. The DCAA also elected Edward Darke, currently the show’s Chief Steward of Livestock, as its President for 2018. As one of Devon’s foremost sheep breeders, with a particular interest in the magnificently-fleeced Devon and Cornwall Longwool breed, Mr Darke and the Countess of Wessex should have plenty to talk about - HRH being a keen and active supporter of the Campaign for Wool, started by The Prince of Wales to promote British wool.